Review of Bombshell: Dramatic Make up for the Stage, Photos & Glamourous Occasions – A t i s h e h. Dance. Fitness. Joy. Princess Farhana’s description of a dancer’s war paint sums it up pretty nicely. Bombshell: Dramatic Make up for the Stage, Photos & Glamourous Occasions is not about subtlety, appropriateness, or painstakingly blending taupe into beige. It’s about glamour, colour, glitter, and having a hell of a lot of fun with your face. A bit of background about myself: I’ve never thought of myself as particularly girly, and I don’t wear much makeup on a regular basis. I like the look of fresh skin, so I almost never wear foundation, and I work in a slightly conservative field, so purple mascara is out for daytime. Well, I’ve described Dr. Jekyll to you, but there is also Ms Hyde. Lurking deep inside me is not a girly girl, but a full-blown drag queen just dying to come out. As a preteen, Kevyn Aucoin’s Making Faces was my makeup bible: I studied the pictures and descriptions, and wondered where in the world one could get the cream eyeshadow he used so often. I would do outrageous looks with my friends and photograph them. I began to acquire a perversely large makeup collection, with probably every shade of glitter and eyeliner imaginable. In the year I was finishing my dissertation, as a full-fledged Serious Person, I would interrupt the tedium by painting high glamour makeup looks on myself, running and showing my boyfriend, and then taking them off. In grad school I even wrote a seminar paper on anti-cosmetic rhetoric, and did a bit of makeup of student theatre. And my secret plan B has always been to go to cosmetology school and run off to Milan. So this is to say that I’m passionate about makeup, I know a lot of tricks, even if I haven’t tried them, but because I don’t wear huge amounts of the stuff on a daily basis, there are also quite a few things I don’t know. For example, although I own several sets of false eyelashes, I’ve never managed to put them on. But I was, you can imagine, extremely eager to take a look at Bombshell. Princess Farhana kindly hooked me up with a review copy, and I’ve been watching it bit by bit over the past month. It’s a massive two-DVD set that covers some makeup basics such as tools, foundation and contouring, false eyelash application, and lips, and then proceeds to focus predominantly on eye looks: retro, movie star, smokey eyes, sixties’, Cleopatra-style, Arabic, modern colour-blocking, and mature makeup. (These are partly my names for the looks.) In a final chapter, Princess Farhana discusses the use of, what else, glitter! What I was particularly curious about was this: when there are so many makeup how-to videos on YouTube (Lauren Luke famously used her YouTube channel to rise from rags to discount-makeup-riches), what would a DVD offer that would be new? Why shouldn’t I just watch a dozen YouTube videos instead? – Video quality. Bombshell is professionally filmed, and it’s easy to see DeVilla and the Princess at work. This is not someone sitting in a darkened living room. – Diversity. The models have different eye types, are of different races (there is an Asian and an African-American model), and ages. The Princess devotes one of the chapters to making hooded or small eyes look big. So while the instruction is nominally about how to do a variety of dramatic eye looks, all along there are tips and tricks for adapting makeup to different kinds of faces. – Expertise. This is the big one! Princess Farhana, a bellydancer, and DeVilla, a bellydancer and makeup artist, bring their showbiz experience to bear on this. They teach a lot of techniques that are specific to the stage or to photography, skills such as: contouring for the stage, what colours look good in black and white photography, what looks bad in photography or in a small restaurant, how to use glitter to get glossy lips without the dangerous stickiness of gloss, how to use white makeup or crystal appliques to open up the eyes, and so on. Throughout the videos, they differentiate between stage and everyday makeup looks, often suggesting how one look might be toned down or played up for a different context. They also give specific advice for performing in a restaurant or on a small stage vs the big theatre. This is the kind of expertise you won’t get on YouTube! I even liked the fact that, in the section on lashes, DeVilla demonstrates a painstakingly precise way of applying them, and Princess Farhana shows a quick and dirty showgirl version. While I’m unlikely to be on a large stage anytime soon, I did learn a few things I can take away. For example, I’d used dots of white goo in the corners of eyes when doing stage makeup, but I didn’t know the more subtle ways this could be adapted to everyday wear. 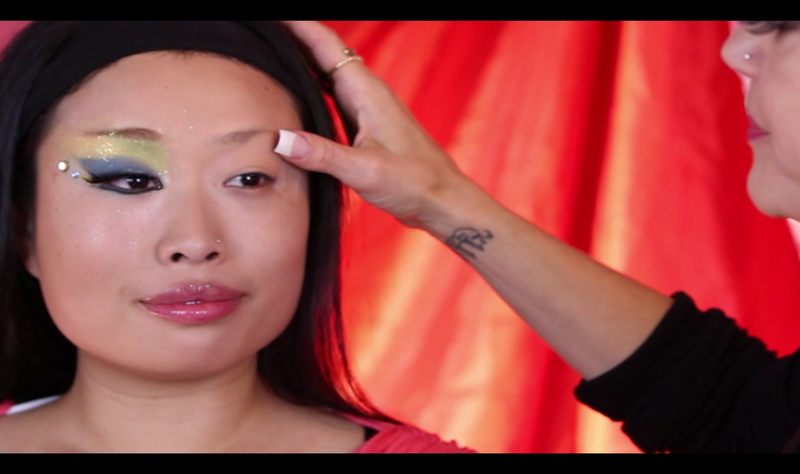 Princess Farhana shows some faster ways to blend, using her finger or glitter, that I might try when in a rush. And I’m much more likely to experiment with colours or combinations I don’t usually use. Such as lavender. Who uses lavender? Is it still an objective review if I want to hang out with these two? My favourite aspect of Bombshell is the way its two stars come across as completely chill and playful. I took a workshop with Princess Farhana ages ago, and I love her wacky sense of humour. She’ll be working on a look which looks completely ridiculous, but she’ll acknowledge that that particular step in the process looks weird, or that she’s making a stupid face to put on eyeliner. Then again, her little quips — she describes one makeup look as hanging out in an opium den with Rudolph Valentino — also show her range of references. (I have to think of those moments on RuPaul’s Drag Race or Project Runway when contestants don’t know what the 1940’s or 1970’s looked like! I always sound a deep, melancholic sigh.) In a final scene, DeVilla and the Princess wipe each other’s war paint off, laughing away. It’s just the right spirit: makeup is fun, a way to be outrageous, and always forgiving. After all, in what other part of life can you always wipe away your mistakes and try again?